I'd been using my first SLR, my Zenit EM, for a few years when I started to become obsessed with exposure. To be honest, I didn't really 'get' exposure completely; I got the basics of shutter and aperture but what I didn't get was what happened when you switched lenses. I didn't understand that f4 on my 200mm let in the same amount of light as f4 on my 50mm. How could it be the same when the 200mm lens contained so much more light-eating glass than the 50mm? In my delusion I became convinced that I needed TTL (through the lens) metering. At the time (mid-80's) the Praktica MTL cameras were to Brits what the Pentax K1000 was to Americans. If you took a high school photography class half your class would likely be carrying some kind of Praktica MTL. It was popular for much the same reason as the K1000; simple, tank-like mechanics, with an reliable match-needle meter and no bells and whistles. This describes both the MTL-5's strengths and weaknesses. Things I like about this camera include the beautiful, metal bladed, focal plane shutter which is strong and accurate. The winding and film loading mechanisms are both well engineered. I like that you can't accidentally leave the light meter on; pulling the lever above the shutter both stops down the lens (in automatic mode) and activates the meter. As a result the battery lasts for ever. I do also like the front position of the shutter release which, although a little unconventional, is very comfortable. On the down side, the smooth vinyl covering is a little slippy. On my example the film counter has jammed for some reason. For some reason I never found the MTL-5 inspiring like my first SLR (the Zenit EM) or my first modern SLR (the OM-2 spot). It was/is a good workhorse camera that I always feel I should dust off and take for a walk for old-time's sake but I never get around to it. I'm curently using a Canon AE-1 with a Canon 50 1.8, a Sigma 28mm 2.8 macro and a Tamron CTR 135 2.8 lenses. I found a Practika MTL 5 with 50mm 1.8 and 28mm 2.8 lenses and also a Praktika flash in superb condition for just 95 Euros (about 75 US $). What is your opinion? Is it a good deal? I'd say $75 is a good price from a MTL5 and 2 lenses, however, I'm not sure about your math. 95 Euros is about $120 not $75. For that price the MTL5 is not such a bargain. It sounds like you have a nice, basic AE-1 system in the making so you have to consider why you want to buy in to another system. The Praktica doesn't provide any more functionality than does the Canon, apart from the ability to use screw mount lenses. Perhaps invest in some more Canon glass instead. That said, the MTL5 won't disappoint you in the image department if you do decide to go for it. Thanks for the immediate responce...I know that my AE-1 system is enough for the type of photography I do (mainly I do what is called "artistic" photography, so I don't care about automation, speed etx of the camera). Bill, I'm a huge Olympus fan. 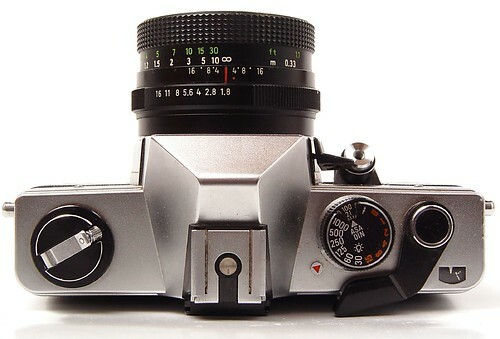 The Praktica is OK but an OM1 is a classic piece of design and the Zuiko lens are just beautiful. I'd definitely encourage you to hunt down a nice OM1 rather than the MTL-5. One question though, the aperture ring on the lens seems to be broken. It rotates smoothly from side to side without any click-stops. Perhaps this is how it is meant to be? Yes, I get around. About your lens, it depends what model of lens you have. I think that any lens that originally was sold with the MTL5 would have 'click stops', however, someone may have put a n older lens on there before you got it. I have a couple of old Russian lenses (which are copies of even older German lenses) that have a 'continuous' or 'clickless' aperture. Most lenses from the 60s or 70s on forwards click to the stops though. If yours doesn't, it might not be such a big deal. The click is implemented in the lens with a series of notches in the aperture ring and usually a small ball bearing held in place with a spring. If any one has attempted to repair this lens they may have lost the tiny ball bearing (all too easy to do - the voice of experience after spending an hour with a magnifying glass on the rug before now). Alternatively the grease which is packed into the lens when it is made may have moved or become really tacky and stuck the ball bearing in the up position. If you're feeling really brave you can try taking the lens apart and seeing if you can fix the problem but it should work even if it doesn't click. The 'automatic' lenses for these M42 cameras have a little pin sticking down inside the camera. If you push this in the aperture should close to the correct position. If your lens doesn't have this pin it may be an older non-automatic lens. 'Automatic' only refers to the aperture - in other words, you can focus and set the aperture with the aperture wide open - then, when you press the shutter, the lens stops down before the shutter opens. These lenses have a 'M/A' switch and the pin previously mentioned. If it isn't 'automatic' you may have to manually stop the lens down before pressing the shutter. I have a couple of old Zenit lenses that work like this; you set the aperture and focus with the lens wide open, then you manually stop the lens down using a twist control on the lens before you take the shot. This isn't very convenient. An 'automatic' lens is much easier and less error-prone to use and they are cheap to pick up. I hope this makes sense. If you have any more questions just let me know and send me the make and model number of the lens itself and I may be able to help further. Thanks for the info. The lens appears to be exactly what you have in the photo posted here. I confirmed that the aperture ring is not functioning properly by setting it on bulb and holding the shutter open with the back open. Try as I might I can't get it to vary from what looks like a pretty wide-open f/2.x or maybe even f/1.8. I was going through some of my dads junk and came across a Praktica MTL-5 with heaps of accessories, (listed below) i know nothing about SLR cameras and am wondering if you could tell me what would be a recommended selling price? I live in Australia so please tell me what currency you use! 2x Square Glass filters 1 is half clear and half blue, the other is half clear and half green! Thanks heaps, i hope this all makes sense! Bearing in mind that I'm not a camera trader but that I just search completed auctions on ebay to judge a camera's value anything I say is pure speculation. Unfortunately, the MTL5 is not very sought after - in the US where I live it is little known, and in the UK where I come from it is very common. The camera body seems to go for $25-50 (US) or UK equivalent in pounds in decent, working condition. You don't give me the focal length of the Hanimex lens but I am guessing it is the relatively common 80-200mm - they've gone for $10-20 US on eBay recently. I can't find a Carl Zeiss Jena Prakticar 3.5/135 for sale in the US recently but in the UK they seem to go for between $50-100 (US equivalent). There's a 2-3x extender with a buy it now price of $15 like the one you have, currently on eBay. The flash is probably worth $10 and the filters $2-5 each. You'll get the best price for your gear on eBay - as I said, I think the Praktica M42 stuff is pretty undervalued at the moment but I don't think holding on to it will increase the value much. Unfortunately digital has killed the value of old, manual cameras. Thank you so much for all your information, i didnt think it would be worth much but seemed useless just sitting in the cupboard, im sure someone out there would appreciate its use. Will see what i can get for it on ebay! Thank you, your website is great! I have just picked one of these up at Oxfam - came with 35, 55, 200 and 80-200 zoom lenses plus 2 x teleconverter in a lovely retro aluminium case and all for ï¿½49.99. One question - I followed your link to the manual, but I don't really understand the film loading instructions, specifically the bit about the wire bracket not standing upwards - correct with the knurled disc if necessary? A quick idiot-proof explanation of how to load is what I'm looking for, I suppose. Thanks in advance. Good site, by the way. Think I have found the answer I'm looking for in discussion thread on the Praktica group on Flickr. Had a look at your photostream, some great stuff there! thanks for visiting both my site and my flickr stream. It sounds like you found a great bargain at Oxfam - the only cameras I ever find at thrift stores over here are either the plastic ones a tiny step up from disposable cameras or are so broken and incomplete as to be beyond repair. You have restored my faith in a bargain. I picked up an old MTL5 at a market in Berlin some years ago. I bought a battery for it at the time but can't remember the name or type. I've recently dusted it down to use again and I need to replace the battery. Can you point me in the right direction? From what I can find out on the net I'm thinking its a mercury px625...are they still available in camera shops? Eamon - yes, you're looking for a PX625 - check out http://www.camerapedia.org/wiki/PX625 for resources and information. 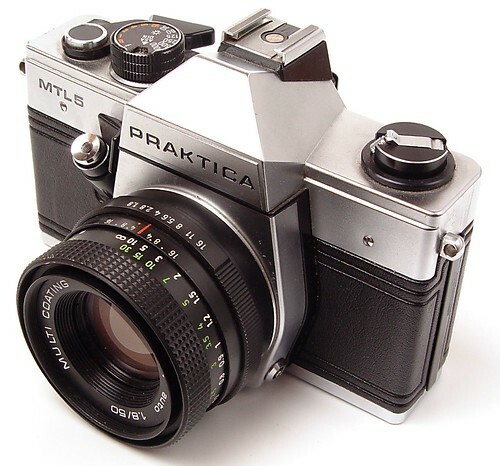 Tenho uma PRAKTICA MTL5, nova a estrear de 1984, quanto custa nesta altura? Vale a pena iniciar-me na fotografia com esta mÃ¡quina? Um abraÃ§o e atÃ© breve.